In Model Railroad Planning 2008, Don Mitchell quotes well-known U.S. model railroader John Allen on the subject of small layouts. John’s first layout was 43x80in (1.1x2m), a small layout even by the definition used in this site (under 24 square feet or 2.23 square meters). Here’s what John Allen had to say in an article titled, “Some Advantages of a Small Layout,” published in The HO Monthly in 1950. Hear, hear! This web site is pretty much dedicated to exploring the fun of small layouts. Every track plan, whether a micro or the Canadian National Illinois Central, comes down to a combination of six components. Carl has outlined all of them here, so I am just summarising them. Spur. Put a single switch on a straight piece of track, and you have a switching puzzle. Passing Loop. Put another switch facing the first one, so the tracks split into two, then back into one. Wye. Why not? Three switches placed together, joined frog-end to frog-end, and you have a simple turnaround track. Balloon Track (Return Loop). A single line with a switch that goes out to the east, loops around and comes back to the west. Switchback (Zigzag). Train goes forward into a stub-ended track, reverses up another track and then goes forward on a third track. Stub ends. Single piece of track with a bumper on each end. That’s it. All railroads we see from the humble tourist train going a few hundred feet through the park to the greatest of transcontinentals is a combination of these factors. The trick to designing a successful model railroad is to combine any or all of the above into an interesting combination. Turntable. A rotating piece of track, pivoted in the center, that joins to a number of any of the above, though typically mostly to spurs, which sometimes terminate in a roundhouse. Fiddle Track / Fiddle Yard. An invention of the British, I’m told — it is a hidden yard (either through or stub-ended) where one can rearrange locomotives and rolling stock so that they reenter the layout as new traffic arriving from a distant place. 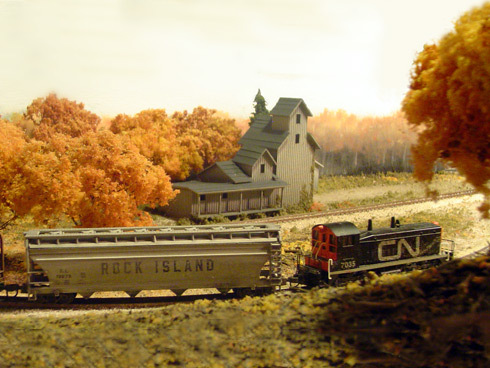 The fiddle yard often acts as the “rest of the world” beyond the visible layout, providing a destination for departing trains as well as a source of new traffic. I would also take a moment to salute Carl Arendt here in his extensive publication of layouts with Fiddle Tracks, Traversers and Sector Plates — essentially popularizing a whole range of Micro Layout solutions for all of us. Kickback. More than a spur, less than a switchback. A spur formed with two frog-end facing switches, making a spur with both a facing-point and a trailing-point component. Very non-prototypical. Kickback arrangements do exist and on a larger scale than believed. Especially in Europe, where too often space is a premium, this type was moderately well used. As a matter of fact, even NASA uses kickback configurations on their Florida launch base. Google Earth shows it on the two most northerly launch platforms near Picnic Island, each on the northwest perimeter of the launchpads. There are a few words associated with Micro Layouts that new users might be interested in knowing the definitions for. An arrangement of five turnouts and connecting tracks to form a runaround loop (passing siding) and three spurs. Invented by John Allen of the U.S. in the 1960s as a switching/shunting game. See Scrapbook #42 for more information. 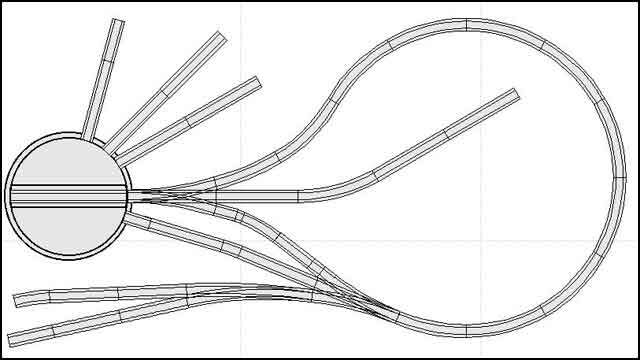 On this site, any small layout consisting of a runaround track with spurs off it is called a Tymesaver to distinguish it from Mr. Allen’s specific track configuration. A very complete discussion of the Timesaver is found at the Model Railways Shunting Puzzles website. A shunting game/puzzle involving three sidings and a headshunt (drill track). Object of the game is to assemble an outbound train with a specific sequence of cars, selected at random. Invented by Alan Wright of the U.K. in the 1980s, this puzzle generates very complex shunting problems from a minimum track configuration. See Scrapbook #69 for a variety of examples. A very complete discussion of the Inglenook is found at the Model Railways Shunting Puzzles website. Great ways to make a small switching/shunting layout considerably more fun to operate! The locomotive may never enter the fuel loading siding. If neccessary the tankers must be pushed into the right place in the siding (or retrieved) using other wagons. The fuel wagons must never be coupled directly to the locomotive, or directly to the guards van (caboose to those on the other side) but there must always be at least one wagon between at each end (the “barrier wagon”). As far as possible the locomotive must not run directly alongside fuel wagons (empty or full) in adjacent sidings. Another problem can be added by placing all three sidings on a car ferry (a la Jack Trollope) s— the new rule being that the locomotive cannot board the ferry, but must use one or two “idler cars” as a handle to pick up wagons parked near the rear of the ferry. Some people also use “situation cards” — instructions that override the switch list, replicating emergencies faced in real life, such as “Engine drops a rod. Swap for another” or “Hotbox on boxcar #___, place on house track for repairs”, etc. You pull one from the deck whenever a timer bell rings. Q. I have a couple Shinohara 3-way turnouts, one Shinohara curved turnout, several lengths of Peco flextrack and Atlas Custom Line #4 turnouts and track sections, all in HO scale. I’ve been fascinated with shelf layouts as they provide more track per square foot than other layout designs. The problem is to combine what I have into a viable shelf layout. I would appreciate any design suggestions you may have to utilize my existing track. – P.S. A. There are a good many layouts on my website that would use at least one of your three-way turnouts. The only one I can think of that uses more than one 3-way is Bob Moroch’s Different Timesaver in Scrapbook #54. Bob uses up to four of them! His basic design, with two 3-ways, can be augmented with other switches in lots of ways to add to the operating fun. Brian Wilson’s excellent On30 shelf line, Moore’s Yard, also makes a good basic plan that can be extended in lots of ways. Photos are in several places on the site, including Scrapbook #63a and on Brian’s website (linked in the article). Finally, I can’t resist attaching a layout I designed for a friend just last week. It uses Roco N track for HOn30 scale (to fit in a commercial storage box) but would work fine in HO standard-gauge as well. Coincidentally, it requires two 3-way switches and a curved turnout! 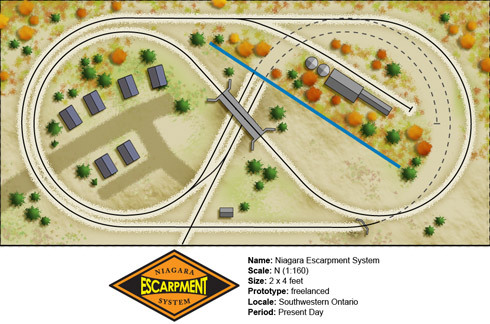 While not specifically based on any particular railroad, the Niagara Escarpment System does owe its genesis to the inspiration gained from studying the Guelph Junction Railway — a small branch line operation managed by the Ontario Southland Railway. It’s not a micro … but it’s gorgeous! I knew these guys were building this gem for awhile, but they didn’t have English pages to tell the rest of the world. I helped them out in translating the Dutch pages into English, but be prepared to find some bad grammar and incorrectly translated words ;-). Here’s the page. Q. N Scale is 1:160, with a 9mm gauge, right? British N Scale is 1:148, still on 9mm track, to make up for British railways’ small loading gauge. But the British finescale group, the 2mm Association, models at a scale of 2mm=1ft, with a gauge of about 9.5mm. Japanese N Scale is 1:150, still on 9mm track, mostly representing 42in gauge railways. Nn3 uses Z gauge (1:220 on 6.5mm gauge) track and mechanisms to represent narrow gauge railways in N Scale, typically modelling 3ft gauge prototypes, but actually scaling out closer to 42in gauge (used by railways in Japan, parts of the former British Empire, the surviving San Francisco cable car lines, and some former streetcar systems such as the Los Angeles Railways and Denver Tramways). N Scale track is used for HOn30 modeling (30in gauge in HO scale), which is often a convenient proxy for either 2ft gauge (typically Maine prototypes) or 3ft, though 30in gauge railways have in fact existed. The 9mm gauge is also in use for TT9 (UK, 3mm=1ft, used for 3ft prototypes), Sn2, On18 (U.S.), On15/O9 (U.K.), and Gnine modelling.